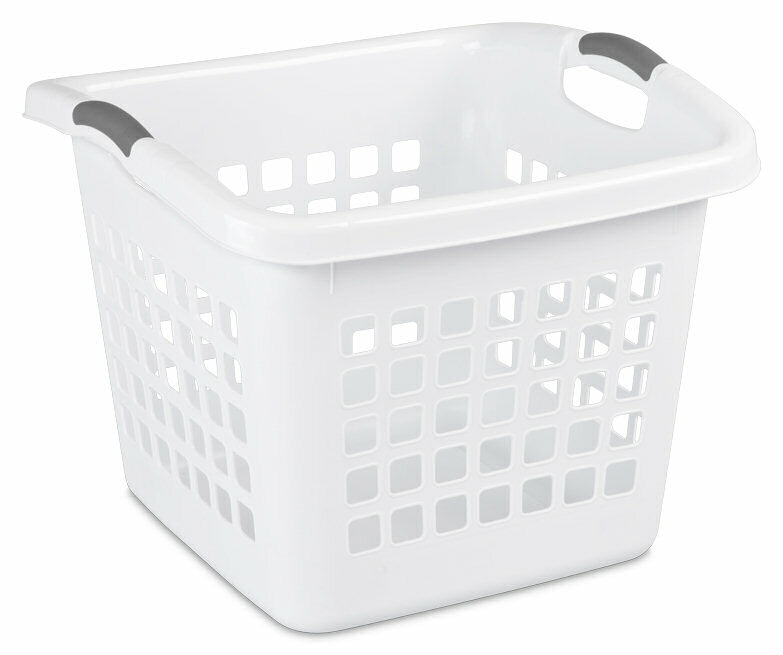 The 1.75 Bushel Ultra™ Square Laundry Basket offers a modern contemporary look and feel with a polished finish. Its compact design occupies less floor space and the reinforced rims ensure full baskets will not bend or break. The ergonomic, integrated handles makes transportation comfortable while the stylish square hole pattern enhances airflow. The comfort grip handles and square shape make it easy to transport full loads to and from the laundry room. This basket offers a generous 1.75 bushel capacity. 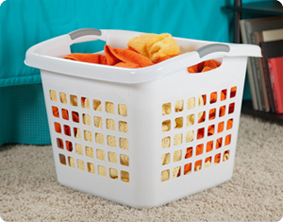 When not in use, the laundry baskets stack neatly and nest together creating more efficient storage space in your home. The overall dimensions of this item are 19 1/2" L x 19 1/2" W x 15 7/8" H.
Overall Assembled Size: 19 1/2" x 19 1/2" x 15 7/8"
Great for transporting loads of laundry to and from the laundry room. 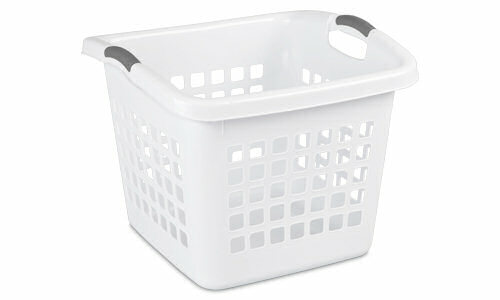 1.75 Bushel Ultra Square Laundry Basket is rated 1.6 out of 5 by 5. Rated 4 out of 5 by Kris from Good size for up & down stairs And the right size load for my front load washer. We have some of the bigger Sterilite laundry baskets also, but they hold too much - they are difficult for me to lug around (even with the hip-holding shape), or I try to put too much in the washer at once, or the clean clothes get wrinkled while I'm folding. The smaller size just seems to work better for me. I haven't had any of the handles break or the sides crack, like some other users have reported. My favorite basket. Rated 1 out of 5 by Momof3 from Handle broke right away Don't waste your money on this basket. Handle broke right away carrying a normal size load of laundry downstairs. Other Sterilite baskets hold up better, don't even contemplate getting this one. Rated 1 out of 5 by JaneDoe108 from Worked well for a short time due to design flaw Pros: The shape of this basket is perfect for carrying up and down stairs. Con: There's a flaw in the way the handles are designed. When you pick it up you slightly twist, over time (like a year) the handles break off. Rated 1 out of 5 by YMR from I do not reccomend this laundry basket. I use you bins for storage all the time and so I purchased this laundry basket. The handles broke and then the sides started to crack. I am not happy with this product. Rated 1 out of 5 by michellereneejenkins from Handles broke very quickly I have used Sterilite products for years. I typically find them to be a good value and decent quality. I was unhappy with this design however. The actual handles (the white plastic part) are paper thin and can't hold up to typical loads for long. The gray "ergonomic" parts popped off after about 3 loads. After I gave up reattaching the gray parts, the white plastic parts both cracked completely off. I'm a typical housewife with a family of 4 doing typical amounts of laundry. This basket was very disappointing.